The following information was drawn from the National Register of Historic Places application prepared by Christopher Stratton of Fever River Research, and the Gustave Koerner House Restoration Brochure. Gustave Koerner first built his Belleville home, an imposing Greek Revival structure, in 1849, and rebuilt it in 1854 after a devastating fire. With his stature as an intellectual and statesman and the home’s location at the main entrance to Belleville’s National Historic District, the house has incalculable value as a historic property. Once restored, it will take its rightful place among the crown jewels of Illinois historic sites. Greek Revival structures began to be adopted on the Eastern Seaboard during the late 1810s and spread westward from there. The style was destined to remain popular in the United States up to ca. 1860 and was so common that it was referred to as the “National Style”. By the time the Koerner House was erected, Greek Revival was a well-established if not conservative style. The house was well built and substantial in size, but not overly elaborate––attributes that bespeak of Gustave Koerner’s successful career but essentially modest character. The Koerners had only recently paid off the costs of constructing the house, and its destruction put them in a difficult financial situation. Even so, Gustave refused to accept the funds that were raised from a building subscription initiated by his friends. Within days of the fire, the ground had been cleared, and Koerner had signed contracts for rebuilding the dwelling. While Koerner’s description of the fire mentions the east and west walls of the house having been blown down during the fire, it is not clear whether the building was completely destroyed. The wing–which he mentions–may have survived the fire, and the existing foundations beneath the main block been reused. It is not known what extent the rebuilt portion of the house resembled the original, though they may have been nearly identical, considering the planning on the Koerner’s part. On January 13, 1855, the Belleville Times reported that the house was still under construction. The Koerner House is depicted on a ca. 1867–1869 lithograph by Schrader, which looks south towards the residence from the intersection of Abend and Lincoln Streets. At this date, the main block of the house had close eaves and a simple brick cornice with dentils. The lithograph also shows the rear porch in its original configuration, being open and L-shaped. A fence surrounds the house lot. 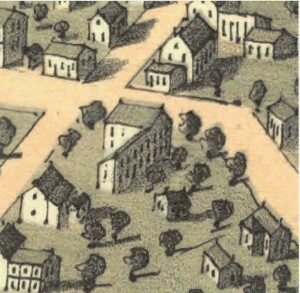 The Koerner House also is depicted on an 1867 bird’s eye view of Belleville (Ruger 1867). Bird’s Eye View of the Gustave Koerner Home (Ruger 1867) prior to addition of the large bay window on the rear service wing. The 1889 Sanborn fire insurance map of Belleville indicates that a two-story bay window had been added to the east side of the rear service wing by this date. This source also depicts a small, one-story, frame outbuilding – possibly a summer kitchen or carriage house – lying to the southeast of the house (Sanborn-Perris 1889). A ca. 1890 photograph shows the house largely as it appears today, with reconfigured cornice and side bay window. It is suspected these exterior modifications may have been undertaken ca. 1875. 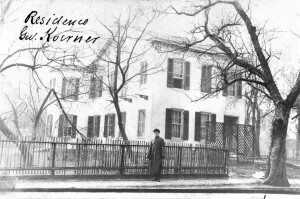 During the forty-seven years that Gustave Koerner lived in the Koerner House, it served not only as his family home, but also the site of social events related to his political career. There also is little doubt that he prepared much of his public and private writings at the residence. 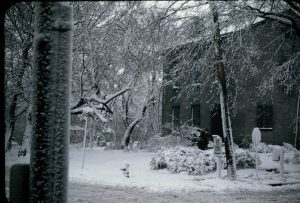 Although some of Koerner’s political affairs may have been conducted out of his legal offices in Belleville, none of these offices remain standing today. As such, the residence at 200 Abend Street remains the property most closely associated with this nationally significant politician and German-born intellectual. This 1890s postcard photo shows the east side second story cast iron porch had been removed. It is not known when it was removed. Following Gustave P. Koerner’s death in April 1896, his heirs appear to have rented his former residence to Fred Paro for a time. A rent receipt from Paro, dated February 1899, is included in Koerner’s probate file (St. Clair County Probate Record, Roll 122, Seq. 400063). On May 26, 1899, the Koerner heirs sold their father’s residence and associated land (lots 8, 9, and 10 of Koerner’s Addition) to William Winklemann. Winklemann owned the property until 1918, when he sold it to Wilhelmina Wehmeyer (St. Clair County Deed Record 270:245; 518: 186-187). This 1940’s picture was taken from across the street where Miller Florist was located at 127 Mascoutah Ave. It is believed the woman on the sidewalk is Wilhelmina Wehmeyer. She rented the upstairs which was known as 200A Abend. Thanks to John Moynihan, MIller descendant, for the photo. Regrettably, the structure has been sadly neglected and abused for decades. Converted to modest rental flats in the 1920s, it then became a rooming house for the elderly around 1970 and was again made into rental units in 1984. Years of neglect and deterioration have caused damage to the roof, gutters, cornice, foundation and windows. Masonry is crumbling or missing; damaged guttering and downspouts have leaked water into the walls; decayed window sills and jambs have caused additional water damage. Of four original chimneys, three and a half are missing. Verandahs are gone, stone stoops have buckled, the paint is peeling and the mechanical systems are long obsolete. Pests and vandalism have also caused damage. Still, much of the dwelling’s original architectural fabric survives intact, most notably the front door’s full complement of transom and side lights. Other intact elements are the stone lintels on the front, window sash, the elegant open staircase and handsome mantelpieces.